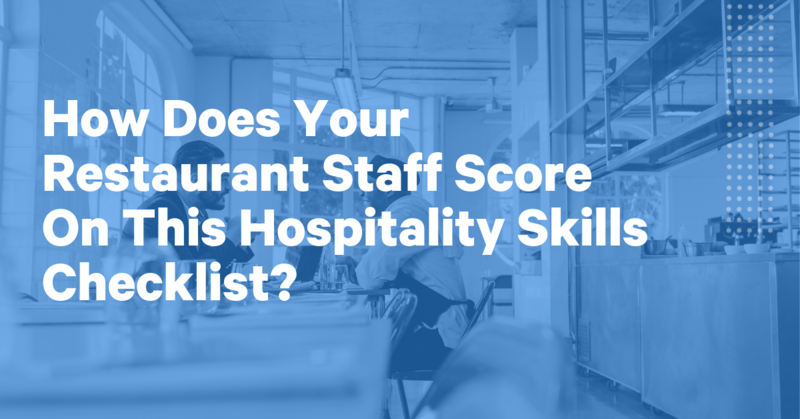 How Does Your Restaurant Staff Score On This Hospitality Skills Checklist? You've heard it once, you've heard it twice, heck – you just may have heard it 1000 times: your front of house staff members are the face of your restaurant; the physical embodiment of the brand, mission, and vision you're working to move forward. As such, it's vital that they are not only trained in the art of top-notch hospitality, but that they also have a deep, intimate understanding of the what, why, and how behind their actions. Service with a smile is a thing of the past. Today's restaurant-goers are expecting a memorable dining experience with warm, genuine hospitality seamlessly interwoven through every part of their visit, from the moment they make a reservation online all the way up until they sign their receipt. If you're not ready to dazzle and delight each and every guest, you're not ready to work a shift. Leaning on my 40+ years of experience in the restaurant industry, I've put together a 9-point checklist to help you and your front of house staff gauge the strength of their hospitality skillset and overall workplace readiness. √ Are You Physically Prepared For Your Shift? It starts before you leave home. Do you understand the hours of service are hours spent on stage for all the world to see? Your guests will be making memories, mini-movies in their minds, and you will forever be in their mental (and digital) pictures. Your staff's personal presentation can either add to or detract from the ambiance and aesthetic you've worked so hard to create. Put yourself in your guests shoes: if the server who came to take your order had unkempt hair, food-stained clothes, dirty fingernails, and deep bags under their eyes, would you be a little apprehensive of how your dining experience will play out? Better yet, would you be apprehensive of what's going to come out of the kitchen? Pretty likely. Look in the mirror - are you bringing your best self? Do you look (and feel) healthy and rested? Grooming wise - Do your clothes fit? Are they spotlessly clean? Is your shirt or blouse freshly pressed? How's your hair? Have you brushed your teeth? Did you remember to D.O your B.O? √ Are You Showing Hospitality Towards Your Co-Workers? I’m pretty sure everyone does this. When I was a server and I first arrived on a shift, I looked around and checked the board to see who else was working that night. I did this because who else was working determined in large measure how the shift would pan out. Some people are really fun to work with. They step it up when meal service gets wild, they have my back if I get in the weeds without even asking, they help keep things in perspective when stress is running high, and they have a sense of humor. Hospitality starts with how we treat one another. Ideally the tone is set by your restaurant's leadership but it's also influenced by every member of your team. Be fun to work with. Keep things in perspective, leave your personal problems at the door, and remember you're not going at it alone. Bring your sense of humor to work. Convey respect and caring to everyone around you, including bussers, line cooks, dishwashers, and fellow servers. The workplace tone need not depend on the leaders, and without what I call "Internal Hospitality” it is difficult to convey genuine warmth and welcome to guests. What do others say to themselves when they come in and see they are on shift WITH YOU? Do you have an "every man for himself" or a "lift together" mentality? When was the last time you helped someone in the weeds? Do you help others without need for thanks or acknowledgement? √ Are You An Advocate For Guests? The most powerful hospitality related insight I ever learned came from the Union Square Hospitality Group. If you haven’t read Danny Meyer’s Setting the Table you must. Their success is based in part upon the distinction between gatekeeping – upholding and enforcing house policies – and advocating for guests – helping guests get what they want, whatever that takes. When a guest feels that whoever they interact with is on their side, everyone wins. Never say “I’m sorry, it’s our policy…” to guests (unless it's for everyone's safety). Policies and systems are for staff. For example, if a guest asks for a meal modification you haven't heard before, don't immediately shut it down. Instead, inform the guest you'll check with the kitchen to make sure the chance it's do-able, and if it's not, you'll work with your kitchen to find a suitable back-up option. If you truly think of your guests as guests and not as customers, the iconic platitude 'the customer is always right' is simply irrelevant. For example: The man at 201 ordered a burger with cheddar, we made it with cheddar, but now he calls you over and says “hey, I told you I wanted Swiss.” He’s wrong, OK? We know he’s wrong, but as your guest he is simply someone who now wants Swiss. In this case, advocating for your guests calls for finding a way to get this guy some Swiss and ignoring whose 'fault' it is. When he leaves and has the opportunity to tell friends about your restaurant, would you rather he recalls the memory of his ordering coming out 'wrong' or would you rather he tells people far and wide about how you remedied the situation with poise and grace? How do you respond when a guest asks for a food or drink modification? When something goes wrong with an order, how do you typically handle the situation? Have you ever gotten in an argument with a customer? Every time a table is sat in your section, do you ask what's brought them in tonight? If you answered yes, then you understand the concept of tailoring your service. Tailoring your service refers to the way front of house staff members will tweak the way they approach or cater to a table based on what they know about the party. If they are tourists, chances are good they want you to be engaging and concierge-like in your approach. A party of five or more? It's likely they're here to celebrate some kind of occasion; find out what that occasion may be and you'll be able to make their experience that much more memorable. Are they first time guests? They’ll appreciate learning the story of the restaurant and will welcome your guidance; you do everyone a service by steering them enthusiastically to your menu’s proven winners. Regulars deserve to be acknowledged and addressed by name. They should be appreciated and made to feel like “insiders.” Make sure your restaurant's leadership – both managers and Chef – know they are in the house. If the regular is a big brand advocate or promoter of your restaurant, do you treat them like a VIP? Can you get Chef to come by their table? Of course there will be some guests – the businessman who is negotiating a deal over dinner or a couple on a blind date – who want you to be as invisible as possible. They too deserve the kind of service they want. How do you greet tables when they're sat in your section? What do you say or do to learn a guest's reason for visiting? Do you have regulars? How did they become your regulars? √ Have You Mastered The Steps of Service? Think back to what is was like when you were first learning how to ride a bicycle. When you were struggling to balance, distribute your weight properly, pedal, keep an eye on the road, and understand how momentum works, could you notice anything around you? Probably not. This is what I think of whenever I consider servers who have not mastered the steps of service. The steps of service should be like second nature to your front of house staff, just like riding a bike. Only when your staff has the steps of service down, then can they shift their focus from fulfilling their responsibilities and tackling operational obstacles to where it really matters: connecting authentically with every guest, making them smile, removing obstacles to their pleasure, giving them great memories, and making them feel important. Do you know the steps of service by heart? Okay, so what are the steps of service? √ Do You Know the Menu Inside And Out? How much do you know about the food and drink you serve? Have you done your research? And, I don't just mean reading the menu, but really researching everything that's on it. That escabeche on the menu, for example. If you learn a little about the traditions and variations, you should have several questions for Chef. Share what you learn with other servers; deepen one another’s product knowledge. You should know more about the food and drink on your menu than your guests. Have you ever taken the menu home to study? If management were to quiz you on the menu, what score do you think you would get? Do you know how to give educated food/drink recommendations without checking the ingredient list/kitchen? Could you describe every menu item to a guest, including taste and potential pairings? √ Are You A Stagiaire? If you are a server or bartender who has long-term dreams of a career in hospitality: have you thought to take the time to stage in the kitchen and learn, hands on, how things are done? This move will surely earn you the respect of the kitchen staff, and, more importantly, it will teach you important information that can be used to enrich your restaurant's guest experience. When you really know your stuff, you will hear guests saying things like, “Oh, how interesting, thank you, I’ve learned something.” You'll also find you spend less time running back and forth to the kitchen to ask questions because you already know all the answers! Any suggestions you make will be taken very seriously; you're an expert afterall. If a guest asks you for a recommendation, can you answer yourself or do you need help from the kitchen? What steps have you taken to develop professionally? How much time do you spend on a weekly basis with the kitchen staff learning about the menu? How could management be doing a better job of helping you expand your hospitality skillset? √ Do You Know How to 'Tell a Story'? This one goes hand in hand with understanding the menu cover to cover: Do you know the backstory of the liquors, beers and wines you offer? Nothing enhances the guest experience like an interesting story. Learn and share with guests the stories behind the beverages you recommend. The craft alcohol space – including craft spirits, beers, and wines from locally owned vineyards – is filled with interesting players who have even more interesting stories about how it all started. Oh that varietal is an excellent choice. This wine is made by the daughter of a long-established Bordeaux wine-making family. When it turned out that her brothers were chosen to run everything, she left Bordeaux and went out on her own. She has won all kinds of awards for the terroir-laden wines she is making in the Languedoc, a long-ignored area now becoming prominent for naturally made wines. The constant wind off the Mediterranean has kept its vineyards free of pests and disease, they have never been spoiled with chemical pesticides. Though it may seem daunting, this word-association practice is a phenomenal memorization tactic that will ultimately help you remember your restaurant's entire drink list. But start little by little: try memorizing drinks and stories by section. Don't worry about mastering the entire drink menu and their respective backstories overnight. If quizzed, could you tell the story behind each alcohol brand on our menu? What is your favorite backstory? √ Can You Sell The Second Drink? The first drink sells itself. If your guest is thirsty or anticipates they will be at any point during their visit, they'll ask you for a drink – probably water. The most novice server can sell the first drink. Novices can get refills too. But, can you sell the second drink? Can you convince your guests to look past the price tag and instead enjoy the experience that comes in another caraf, pint glass, or high-ball? You must have made a connection with you guests so they are open to your suggestion. You must time the suggestion so they are well through their first drink but before the food you are pairing with comes out. Selling the second drink is THE key to growing both your check average and, by default, your tip potential and overall tip income. If you truly think of guests as guests and not as customers – as I keep saying, it’s not just jargon – upselling won't seem like a chore, but instead another opportunity for you to optimize and enhance your guest's experience. Some guests will appreciate your upselling suggestions, while others want your help having a great time on a budget. Respect the difference, make it fun no matter what, and give them reason to trust your advice. Look at your last 10 checks: on how many of them were you able to sell a second (or third) drink? If you sold the second drink to every guest at every one of your tables, how much more money would you be taking home tonight? What would you do with that money? If you're having a hard time selling the second drink, what is causing you the most trouble? Growing your hospitality skillset is a daily task, one that your front of house staff should focus on improving every shift.Print out this checklist and hang it in your server break area; challenge your front of house staff to improve their score with a little friendly competition. No one loses when the game is professional development and improving your restaurant's guest experience.